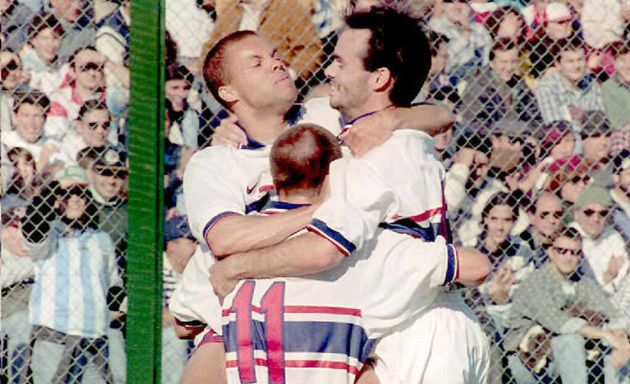 Former USA stars Eric Wynalda and Alexi Lalas recall the remarkable story–both on and off the field–of the Americans' run in the 1995 Copa America in Uruguay in a must-listen podcast with SI's Grant Wahl. It's hard to believe, but it's been 20 years since one of the U.S. national team's most impressive feats outside of CONCACAF competition occurred. A year after hosting the World Cup, the USA went to the 1995 Copa America in Uruguay and won its group by beating Chile and stunning Argentina. The Americans then ousted rival Mexico in the quarterfinals on penalties before ultimately succumbing to Brazil 1-0 in the semifinals and settling for fourth place after a loss to Colombia. This all happened before the era of constant TV coverage and social media, meaning that all of it went down in relative anonymity. The on-field exploits in Paysandú were just part of the ride, though. The U.S. squad almost never took to the field because of a player strike over wage discrepancies between the most- and least-experienced players on the team, and the Olympic team was on call to be brought in as replacements. Eric Wynalda had a go at now-Atlético Madrid manager Diego Simeone. Thomas Dooley just had to buy a specific car. Diego Maradona cried in the U.S. locker room. And there's more. SI's Grant Wahl sat down with former USA stars and current Fox Sports 1 analysts Alexi Lalas and Wynalda to recall the memorable run in great, hilarious and gripping detail.